Translation from Interface - Comunicação, Saúde, Educação, Botucatu, v.14, n.33, p. 345-358, Jun. 2010. Keywords: Healthcare regulation and supervision. Health equity. Healthcare service accessibility. Comprehensive healthcare. Health assessment. Palavras-chave: Regulação e fiscalização em saúde. Equidade em saúde. Acesso aos serviços de saúde. Assistência integral à saúde. Avaliação em Saúde. Palabras clave: Regulación y fiscalización en salud. Equidad en Salud. Acceso a los servicios de salud. Asistencia integral a la salud. Evaluación en Salud. The continuing implementation of regulations for the Brazilian National Health System (Sistema Único de Saúde; SUS) brought in the Pact for Health 2006, which in its Administrative Pact highlighted regulation of healthcare as a tool for promoting equity, accessibility and comprehensiveness of care (Brazil, 2006a). In turn, the national regulation policy provides for putting access regulations into operation: these are defined as a dimension of the regulatory process for healthcare that, through Regulatory Complexes (RCs), aim to shape a network of comprehensive and equitable care (Brazil, 2008). In this light, it was envisaged that RCs would confer a systematic capacity to respond to SUS users' healthcare demands and needs, at the various stages of the care process. This would be an "instrument providing order, guidance and definition for care", which would act "in a rapid, qualified and integrated manner based on social and collective interests" (Brazil, 2000). There was an expectation that RCs might become units for cooperative work towards improving access to the healthcare system, with strengthening and qualification of the care network. Within the local healthcare context in Ribeirão Preto, State of São Paulo, the RC was installed in the Municipal Health Department in 2005, based on the current public policies, comprising regulatory centers for elective and emergency actions that were interlinked physically and conceptually. This initiative had the aim of putting order in the flow of problems and responses within the local SUS network and enabling a more effective and efficacious relationship between the players within this reality, while making the most from the successful experience acquired through regulation of the municipality's emergency services, which had been operational since 2000 (Lopes et al., 2007; Santos et al., 2003). Thus, analysis on a RC, within the concrete space of this municipality, would show the importance of discussing the implications of its implementation for managers, healthcare workers at different points in the network and users. In the present study, while still taking into consideration the combined relationships, a sectional approach was taken in which the aim was to present aspects of the results from implementing the RC in Ribeirão Preto, from the perceptions of one of the parties involved: the workers managing the interventions. The scenario for this study was the organizational space of the RC, which was implemented at the central level of the Municipal Health Department of Ribeirão Preto. In this evaluation, empirical data were acquired from the workers who were managing and operating the RC. The data were gathered in February and March 2007, through interviews, after the project had been approved by the Research Ethics Committee. There were 24 workers in the RC (doctors, nurses, dentists and nursing auxiliaries, among others), of whom 22 (91.6%) agreed to take part in the study. Based on the data gathered and other data coming from document sources, along with the theoretical framework for the investigation, we sought to make comparisons in such a way that we would be able to achieve the "maximum amplitude of description, explanation and comprehension of the focus of the study" (Triviños, 1995, p.138). To analyze the interviews, content analysis was conducted along thematic lines (Bardin, 2000; Minayo, 1998). In 2005, Ribeirão Preto had an estimated population of 551,312 inhabitants (DATASUS), and the SUS network consisted of 64 care-providing establishments. These included primary healthcare units, family healthcare units, secondary units and tertiary units, along with other services that solely provided diagnostic and therapeutic support. However, it was seen that the potential of this network could be further exploited, through more effective linkage between the care-providing components. Thus, one of the lines of the Municipal Healthcare Plan for 2005-2008 consisted of stepping up the regulatory process, driven by the following needs: improvement of the ability to resolve cases and provide continuity of primary care; creation of better order in accessing secondary and tertiary services; and establishment of a communication channel between the different care provision points. One of the interventions promoted along these lines was the implementation of the RC. This not only produced changes in the organizational dynamics, but also allowed the dimensions of the projects competing within the care provision network to appear. These had sometimes been sustained through logic that was clientelistic, economic, corporative and inequitable. The interviewees had the perception that the RC enabled improved access to specialized consultations and complementary examinations of greater technological density. Access to specialized consultations (medical, dental and others) and complementary examinations of greater technological density was achieved through distribution of a number of referral forms (RFs) to each healthcare unit (quota). From the RF, generally taking its issue date into consideration, a date for the procedure was arranged. For some situations, there was a differentiated referral flow (oncology and prenatal pathology). However, for most referrals, there was no classificatory priority/risk analysis on the reasons that generated the requests. This set of factors may be indicative of organizational accessibility problems (Fekete, 1995), thereby compromising the continuity of care, ability to resolve cases and coordination of care, which are essential features of primary care, for it to fulfill its attributes. Starfield (2002, p.367-8) emphasized that "the essence of coordination is to make information available regarding previous problems and services and to recognize that information, insofar as it is related to the needs for the present care provision." In undertaking coordination, the challenge is to establish a relationship that favors interlinking between the points of the network, such that the set of information relating to the user is disseminated and used by the players who have been made responsible for ensuring care provision. According to the interviewees, filling out the RF correctly makes it possible to develop the risk/priority classification and consequently the regulatory action. RFs have become analytical tools guided by clinical consensuses and regulatory protocols, and such actions may directly influence the mobilization of resources for attending to health problems. Thus, when incongruences in RFs are identified at the RC, steps are taken to try to ensure continuity in the care provision process, while remaining alert with regard to not hindering the process, thereby avoiding harm to users. The most frequent problem in filling out RFs, cited by the interviewees, was illegible writing. Moreover, the problem that was most harmful to the regulatory action was incomplete clinical data. When clinical cases were well described, the regulators' work was made easier, and it was possible to identify situations in which attendance could be provided at primary care level, rather than making an initial referral. The importance of the instruments and their information content for regulatory practice emerges here, in the model analyzed. Correctly filled out RFs can help towards understanding the potential ability of the network for resolving cases, through clarifying the responsibilities regarding establishment of care provision. Another point relates to the time taken to make specialized consultations. Before the RC, this varied among healthcare units and among specialties, thereby revealing "disorganization" in the provision and use of care resources, both within the services belonging to SUS and among services used through agreements. Analysis on documents showed that at the start of 2005, some medical specialties presented waiting lists of more than 12 months for consultation appointments, especially dermatology, for which the wait was around 18 months. The words of the interviewees reiterated the data obtained through analyzing the official documents from the Municipal Health Department. 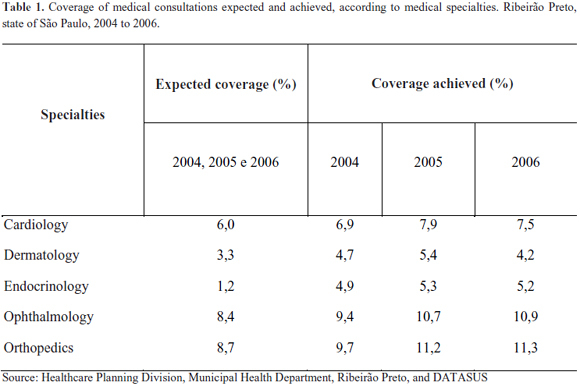 These points, together with analysis on the implementation rate for specialized medical consultations showed that in 2005, the year when the RC was implemented, this rate increased in relation to the preceding year (from 132.46% to 149.02%), as a result of centralizing the provision of this action, thus allowing it to be mapped and hence regulated and arranged by the RC in accordance with the criteria of priority and availability of services. In an analysis directed towards medical specialties such as cardiology and endocrinology (in which satisfactory provision might assist in dealing with highly prevalent health problems in the municipality, like systemic arterial hypertension (SAH) and diabetes), and orthopedics, ophthalmology and dermatology (the specialties with greatest "repressed demand" in the municipality), we saw that from 2004 to 2006, the coverage in these five medical specialties was greater than the amount recommended according to the Ministry of Health's care provision parameters, as can be seen in Table 1. Even though the percentage coverages were already greater than the expected values in 2004, we observed increases in coverage in all the specialties in 2005, which may have resulted from reorganization of the provision through the RC. The increased coverage in 2005 produced a decrease in the repressed demand, with a noticeable decrease in the waiting times in these specialties, especially in cardiology and dermatology. Mapping and optimization of this resource was transformed into expanded provision and improved access, and this was derived from the intensive monitoring conducted by the RC in 2005, in relation to agreement, use and implementation of this healthcare action. Within the general context of specialized medical consultations, the production within these five specialties corresponded to 40.7% (2004), 40.9% (2005) and 41.6% (2006) of the total number of specialized medical consultations produced within the SUS network. However, these percentages deserve greater investigation, in order to identify factors that might or might not explain their continuation, given that even with increased coverage and decreased waiting times, some specialties still presented repressed demand. Thus, the marked demand for specialized medical consultations within the network may have resulted from the care model structured on a specialized basis. From a managerial viewpoint, negotiations were conducted within the SUS services, with reformatting of the agenda of specialized medical consultations, thus resulting in an increased quantity of provision. Among providers of non-SUS services under agreements, a commitment to fulfill the provision that was made available, in a more transparent and effective manner, was requested. All the SUS and non-SUS agreed provision of specialized medical consultations was placed online at the RC, thus characterizing an advance in the managerial capacity of this care resource. Since no additional services were contracted but, rather, the services were optimized through overall mapping of the provision available within the network and prioritization of health problems, taking into account the hierarchical and regional organization at the location, we infer that this measure at least enabled resource use that was more equitable and efficient. Furthermore, the actions of the RC identified and limited certain practices such as reservation of places using fictitious user names, in an attempt to ensure subsequent occupation. Mapping and management of the quantities of specialized medical consultations made available by the state provider to residents of the municipality was not possible, despite discussions on the relevance of such actions for the dynamics of the regulatory process. RCs should continually ensure compatibility between the provision of resources and the population's problems, in real time, as well as monitoring the implementation of actions that attempt to promote accessibility with equity and humanization, while at the same time indicating the weak spots of the care network. In 2006, the implementation rate for specialized medical consultations decreased, and this needs to be understood better. A priori, it should not be identified as a totally unfavorable result. This decrease may have been related to loss of the potential installed capacity (resignation of human resources) or to the actions of the RC, in the sense that referrals started to be analyzed with regard to the reasons for the requests, thereby generating changes in take-up of the care provision. The RC mediated communication between the points in the network, and directed questions both towards primary care ("Would it not be possible to resolve the reason for the referral at primary care level?") and towards secondary care ("Would it not be possible for this case to be followed up within primary care, through a counter-referral?"). However, regarding such approaches, there was a lack of comprehension and commitment among the workers, in relation to the need to shape the healthcare network, which needs to be a producer of care in a shared, progressive, humanized, problem-solving and regionalized manner that is attentive towards ensuring equity and comprehensiveness: namely, a network of mutual solidarity. We concluded that at that time, centralization of the management of this care resource through the RC was important for starting the organizational process of elective regulatory action, with mapping of the demand and provision, which was thus expected to produce advances in attendance of health problems, knowledge of needs, investment and qualification of the care network. [...] the idea of total centralization of public functions is just as unsustainable as the idea of supposing that all necessities for centralized commands might disappear. Decentralization that does not contain the centralist counterpart ultimately signifies dissolution of all criteria for integration, coordination and social synergy (Cardona, 1997, p.12). Nonetheless, according to one of the interviewees, arranging specialized medical consultations was faster before the RC. This would have occurred sporadically, when access was directly to the unit that would provide the service, but would bring onto the agenda the question of putting the concept of equity into operation. The document Renewal of Primary Healthcare in the Americas demonstrates the importance of certain values for establishing priorities within healthcare systems. Among these is equity, defined as "[...] the absence of unfair differences in health status, in access to healthcare and healthy environments, and in the treatment received within the social and healthcare systems" (PAHO, 2007, p.8). Faced with the challenge of placing equity as one of the central values of a healthcare system, is it possible to envisage as fair an organization that provides privileged access conditions to users? Or an organizational arrangement that does not ensure the best response possible for certain health problems at a time of greater precision? Or, furthermore, that the system might favor fast personalized access for some, to the detriment of the great majority facing lengthy delays? In the light of an unsatisfactory diagnosis, it seems to us in line with the action of classifying the priority/risk of cases, to simply leave users to their luck of personalized contacts, without linkage to institutional commitment towards equitable humanized access. The interviewees also pointed out that the RC still did not have control over the time that elapsed between releasing authorizations for examinations of greater complexity to be performed and the date when they were carried out. In other words, even if the RC released the authorization to carry out an examination rapidly, this would not ensure that it was carried out within a short space of time. There is a need for the entire provision of care resources to be within the RC, so that management and control of the regulatory process, which involves following up whether the procedure was implemented within a satisfactory period of time, can be undertaken. Without this mechanism, the guarantee of improvement and an opportune response to users' problems is compromised. It can be expected that this discussion will not take place in isolation, limited to attending the demand, but rather, will be linked to the development of the intended care provision model. According to the study subjects, the RC became a reference and linkage point, supplying a more systematized response to units that had made requests and, especially, to users. This is an essential condition for shaping a humanized network capable of resolving cases. In the interviews, we found reports on the difficulties faced within the daily routine at the RC and on the benefits brought in through the experience, although these are only just beginning. With regard to infrastructure, the main difficulties faced by the RC, according to the interviewees, were inadequate physical space, insufficient logistical support and insufficient human resources. Nonetheless, there was a commitment among the workers towards implementing the RC. Seeking to collectivize the work and management of services through dividing responsibilities and seeking to establish strategies to reconfigure healthcare work so as to heed the clientele's necessities "may signify favoring participative and democratic logic, thereby crediting workers and users with the capacity to become players in a process of construction and creation of different intervention possibilities" (Mishima, 2003, p.12). The interviewees mentioned that sharing the physical space between the centers would have the potential to positively influence the regulatory actions, thereby favoring communications and exchanges of experiences, and consequently increasing the ability to resolve problems. The investments that were made in the structure denoted recognition that changes in the environment might favor the work process. The term "environment", used in the National Humanization Policy, refers to the treatment given to the physical space, which is taken to encompass the social, professional and interpersonal relational space, which should provide receptive, problem-solving and humanized attention (Brazil, 2006b). The term and the concept can also be used in the places where healthcare workers meet to develop their work, thereby establishing spaces that add potential to their actions for the purposes of the work process. However, the teams at RCs absolutely need to work together, in tune with each other, to develop the same care provision project. Within work in general, and healthcare work in particular, workers' participation takes on a fundamental role (Campos, 1997). Thus, considering the unparalleled role performed by healthcare workers, the RCs mediate between primary. Secondary and tertiary care and may form a collaborative instrument for developing the coordination and continuity of care. In this respect, the study subjects said that primary healthcare could count on RC action to improve the ability of its efforts to resolve problems. From the material analyzed, it was learned that from an operational viewpoint, the RC faced a variety of obstacles. At the time of the study, there were limitations relating to information technology support, particularly in terms of operational instability, which interfered directly with the formatting and management of the care provision map. To monitor and evaluate the regulatory action, the RC should have information technology support available. In addition to accommodating care resources, this should make it possible to create mechanisms to put care provision flows into order, oversee the relationship between the management and the various service providers, and produce analytical reports to provide backing for evaluation and decision-making processes. This use of information technology highlights that "changes within the policy dimensions of information management need to be accompanied by technological changes, so that an effective level of information use in the healthcare management process is achieved" (Moraes, 2001, p.51-2). Considering the operational dimensions and accelerated dynamics of the strategy, for its success, it becomes decisive to have available adequate technological resources. Another difficulty pointed out by the interviewees, over the course of time, was non-fulfillment of the provision, both by SUS providers and by non-SUS providers under agreements. This difficulty needs to be weighed up bearing in mind that the providers working under agreements informed what their own installed capacity was. Thus, non-fulfillment cannot be justified unless the occasion is exceptional. With regard to SUS providers, the installed capacity was determined after identifying the human and technological resources potentially available within the network, after intense and confrontational negotiation with the workers. The possible explanations for such occurrences include the RC's low autonomy for maintaining continuous monitoring and holding the implementation units responsible for actions, and the constant tension between the technical and political power of certain groups. The latter appeared as the RC attempted to balance the response to health problems based on the concepts of equity, comprehensiveness, accessibility and regionalization. Another point highlighted by the interviewees was lack of knowledge of the proposals for SUS regulation. Team capacitation for the regulation activities either had not been received or was partial, according to the study subjects. This is a fundamental finding, if it is accepted that comprehension of the proposal and capacitation for regulatory practice influence the qualification of the work process and consequently the result from the actions. The importance of the regulatory and clinical protocols for developing the regulatory actions was identified in most of the reports, and they were understood to be instruments that facilitated regulatory action, thereby aiding in defining the design of the care provision network; individualizing the care provision points according to their installed capacity and potential for resolving problems; systematizing the criteria for regulatory action (thereby diminishing the personalization of the action); proving appropriate guidance for users within the care network; speeding up the scheduling of healthcare actions; and providing team capacitation. Reflections about the protocols were also made, with the view that they were tools that favored dealing with the case, rather than tools surrounded with procedures that would make the possibilities of attending such cases excessively rigid, thereby excluding analysis on individualities. Putting decentralization into operation should be guided in such a way as to "overcome the fragmentation of healthcare policies and programs, through organizing a regionalized hierarchical network of actions and services and through qualifying the management" (Brazil, 2006, p.5). In the specific case of regulation of access, forming a care provision network becomes essential, so that regulatory actions can be scheduled and processed according to the problems identified in the area, preferably at primary healthcare level. The network forms a complex structure and, for functional mutual integration to take place, the complementary and integrative nature of the actions developed by different subjects and attendance points needs to be taken into consideration. The acceptance of complementarity and interdependence denote the dimensions of the complexity of setting up the network and drives the thinking about its configuration (Health, 2006). When the objective of the analysis is strategies for the RC, focusing on its competencies and activities, it can be seen that it is important for there to be a network that enables integration, so that regulatory actions take place in tune with the SUS guidelines. However, in the subjects' words, the difficulty in linking between the points of the network was related to the diversity of the players and their actions, and to the insufficient systematization and dissemination of information regarding the services, their provision and means of access. The diversity of players might not be a blocking factor when taken in the sense that the plurality of ideas and opinions placed in the arena of negotiations helps in reflections and in forming consensuses. "The networks are formed from connections or links between people" and, insofar as they are constructed from the subjects' perspectives, "conflict is a predictable situation, and it determines whether there is any obstruction of the flow of linkage" (Health, 2006, p.58). One path would consist of revealing approaches corresponding to this conflict in order to recompose the links between the subjects and recover the solidarity and power of the network. The RC favored interlinking between points in the network because it reorganized the flow and promoted communication guided by the sense of cooperation and the possibility of sharing experiences between the RC's own teams, even if at that time the focus was on priority cases. In the interviews, the importance of establishing links and behavior of mutual solidarity among the players experiencing the network was confirmed. Such actions strengthen the network internally and externally so that it can reach its aims (Rovere, 1999). However, communication problems between the network points were reported, ranging from structural difficulties, unpreparedness and lack of commitment among some workers, to insufficiency and lack of understanding of information among the RC teams themselves, the units making the requests and users. Although the interviewees recognized that implementing the RC enabled deepening of knowledge about SUS, the workers allocated to the RC also pointed out that this process had not reached workers at other points of the network correspondingly, nor had it reached users. The excessive amount of written communication and the accelerated dynamics of work unaccompanied by diffusion of information on the RC, its purpose and attributes were considered to be negative interference factors for the intervention. Dissemination of information in a comprehensible manner, within the network and in participative forums for SUS, may be a differential for establishing a communication process that strengthens initiatives that are directed towards sustainability of the network and are sensitive to its weak points. Among the set of interviews, social control was found to be implicit, while difficulties regarding the viability of SUS guidelines still existed, in an effective process of shared management and co-responsibility in relation to the healthcare system and self-care. Retrieving user participation, even if flanked with conflict and obstacles, relates to recognition of the reach of the system, with a view to overcoming authoritarian forms of management and achieving a more democratic way of acting in the decision-making process for public policies. Reflection on the subjects' words left the impression that users' access to information and its meanings generally did not take place satisfactorily. The players who construct social control (users, workers and managers) need to be familiar with SUS and its organizational guidelines, and to correlate this information with the local healthcare situation (epidemiological, care provision, financial and political situations) through analysis and comprehension of the set of healthcare information. This stance favors accessibility, participation in the management process and co-responsibility in healthcare production (Silva et al., 2007; Brazil, 2006c; Moraes, 1994). Thus, what healthcare information is needed and how should it be spread so that subjects' autonomy and protagonism is promoted (Brazil, 2006c)? How should it be presented and how can it be accessed so that it can really be understood and placed available for the social players to use, with consolidation of the democratization of SUS? It seems to us that the answers to these questions may contribute towards full exercising of social control. With regard to RCs, this reflection stimulates rethinking of the established practices relating to the communication process and the treatment given to information content, which are implicated in the development and continuity of interventions and in support for participation and social control. A healthcare policy that aims to be equitable should stimulate communicative action that facilitates access to and comprehension of information, thereby strengthening users in their relationship with the healthcare system (Thiede, 2008). Comprehending the magnitude of the evaluation process for qualifying SUS management is indispensable for enabling healthcare organizations to incorporate this practice into their daily routines. Perception of the direction given in developing the assessment is essential for this to really be made effective as an instrument for enabling decisions for which users are necessarily the main targets and beneficiaries of a more equitable and humanized system. Through the logic of the work process of the RC, the most perceptible initial effects from its actions, in the interviewees' opinion, related to detailing of the availability of care resources. Without detailed description and quantification of the provision available and/or required, and support for the whole healthcare program, the regulatory action would not have taken shape. The efforts made in drawing up the map of care resources promoted comprehension regarding the purpose of the regulatory actions, which was transformed into a means for capacitating the RC teams, in an initiative for continuing education relating to organization and evaluation of the system. Centralization of the management of the regulatory process made it possible to become familiar with and view the network in its entirety: its requirements, weaknesses, strengths, scheduling possibilities and control characteristics, which made the RC an important tool favoring evaluative practice. On the other hand, it also revealed situations of corporative privilege that were responsible for many instances of conflict between the local management and the workers, providers of agreed services and users. The interviewees understood that the activities carried out by the RC had stimulated analysis on healthcare practices and had made it possible to review practices that were considered to be inappropriate for good managerial development, such as situations in which providers of agreed services were determining the way in which the care provision would be taken up. This activity was identified as the manager's prerogative, since it is closely related to managerial capacity and consequently facilitates regulatory action. According to the interviewees, the RC strategy was responsible for improving the registration of healthcare data, both within SUS services and within non-SUS agreed services. This action was fundamental for constructing databases that were more trustworthy with regard to generating healthcare information to supply to the organizational, evaluative and decision-making processes. We weighed up the importance of information for success in the interventions when used as an agent for transforming the health awareness of the workers, managers and users, without limitation only to a tangle of obligatory and often incomprehensible compilations of little significance as a device for backing up decision-making. This gives rise to reflection on the precariousness of the transformation process from data into information and the ineffectiveness of information as a support for managerial action in healthcare organizations. If, among the presuppositions of the strategy, there is an affirmation that RCs may constitute qualified observatories for the system, thereby stimulating assessment and strengthening the management, on what basis should information practices be established in order to develop this capacity? Exploring the integrative potential of information is one possibility (Moraes, 2007). Despite the understanding that RCs have the task of monitoring the scheduling of care provision, by contrasting the production achieved and the budget availability at any given moment, especially with regard to medium and high-complexity actions, such actions are little disseminated in the RC, and were only recognized by a small proportion of the interviewees. It was noted in the interviews that the evaluations presented little systematization regarding attendance and management parameters and the need for capacitation and motivation for such practices. The evaluations need to be understood as actions of institutional nature that are instruments favoring the decision-making process. However, it was recognized that the result from the evaluation may be directed according to the way in which the regulatory process was conducted. In this respect, arrangements such as referral and counter-referral may contribute towards the process of evaluating and forming the care network. It is known that counter-referral can take place within the network both for SUS services and for non-SUS agreed services, and that when this occurs, it is mostly not accompanied by detailed guidance for case follow-up. The low occurrence of counter-referrals within secondary and tertiary care may be because of the widely imagined understanding that "the one who gives the best treatment is the specialist", which arises through experience of the hegemonic model of care organization. Moreover, since primary care does not always have adequate provision of medical consultations, it sometimes becomes easier to arrange a consultation with a specialist, which ends up linking the user to a specialized unit. It was also observed in the RC that referrals often did not report the therapeutic actions already carried out at primary care level, thus adding difficulty to regulatory actions and determining the dimensions of the problem-solving capacity of this point of the network. These elements provide a synthesis of the magnitude of the direction given to the intervention, which may, from the evaluation results, induce the RC to reproduce an inequitable, inefficient and ineffective care model in relation to health problems, or alternatively, this may make it a critical instrument for care and management, with a view to better performance for SUS (Mendes, 2002). The RC intervention had the capacity to change the regulation of access to care provision and to affect its workers. In these workers' view, it also affected some of the partners that were important in implementing and developing the strategy. Aspects of the impact of the RC were clearly perceived through analysis on the empirical and documented material, along all the lines discussed: organizing of the RC so as to ensure access and equity; constitution of a humanized care network that resolves cases; the work process among the subjects in the RC; and the potential for this strategy to become consolidated as an observatory for the system and thus to promote assessments for decision-making. However, according to the study subjects, this intensity of influence from the intervention was not observed among SUS users. This deserves to be understood as a signal justifying a separate investigation. Bringing users closer to the proposal would certainly aid not only in senses of implementing and continuing with interventions, but also in consolidating effective social participation. It was clear that, although the RC is a strategy potentially capable of collaborating towards the sustainability of SUS, it lacks investment, refinement and dissemination. Janise Braga Barros Ferreira took responsibility for the stages of theoretical conception, elaboration, discussion, writing and reviewing the production of the article; Silvana Martins Mishima took responsibility for the stages of theoretical conception, elaboration, discussion, writing and reviewing the production of the article; José Sebastião dos Santos, Aldaísa Cassanho Forster and Clarice Aparecida Ferraz were responsible for discussion, writing and reviewing the production of the article. BARDIN, L. Análise de conteúdo. Lisboa: Edições 70, 2000. BRASIL. Portaria n.1.559, de 1 de agosto de 2008. Institui uma Política Nacional Regulação do Sistema Único de Saúde. Diário Oficial da União, Brasília, DF, 04 ago. 2008. Disponível em: <http://bvsms.saude.gov.br/bvs/saudelegis/gm/2008/prt1559_01_08_2008.html> Acesso em: 1 nov. 2008. ______. Ministério da Saúde. Portaria n.399/GM, de 22 de fevereiro de 2006a. Divulga o Pacto pela Saúde 2006 - consolidação do SUS e aprova as diretrizes operacionais do referido Pacto. Diário Oficial da União, Brasília, DF, fev. 2006. Seção 1. Disponível em: <http://www.saude.gov.br/sas/.htm>. Acesso em: 10 out. 2006. BRASIL. Ministério da Saúde. Secretaria de Atenção à Saúde. Núcleo Técnico da Política Nacional de Humanização: ambiência. 2.ed. Brasília: Ministério da Saúde, 2006b. ______. Ministério da Saúde. Secretaria de Atenção à Saúde. Núcleo Técnico da Política Nacional de Humanização. HumanizaSUS: documento base gestores e trabalhadores do SUS. 3.ed. Brasília: Ministério da Saúde, 2006c. ______. Ministério da Saúde. Portaria n.356, de 25 de setembro de 2000. Dispõe sobre os recursos financeiros, por estado e Distrito Federal, destinados à implementação do Componente II do Programa de Humanização no Pré-natal e Nascimento - Organização, Regulação e Investimentos na Assistência Obstétrica e Neonatal. Diário Oficial da República Federativa do Brasil, Brasília, DF, n.185-E, 2000. Disponível em: <http://www.saude.gov.br/sas//sasset00.htm>. Acesso em: 30 jan. 2006. CAMPOS, G.W.S. Subjetividade e administração de pessoal: considerações sobre os modos de gerenciar o trabalho em equipe de saúde. In: MERHY, E.E. ; ONOCKO. R. (Orgs.). Agir em saúde: um desafio para o público. São Paulo: Hucitec, 1997. p.229-66. CARDONA, A. Marco teórico para la gestión descentralizada de las políticas de salud. Rev. Facul. Nac. Salud Publ., v.16, n.1, p.9 -26, 1998. FEKETE, M.C. Estudo da acessibilidade na avaliação dos serviços de saúde. In: SANTANA et al. (Orgs.). Desenvolvimento gerencial de unidades básicas do Sistema Único de Saúde (SUS). Brasília: Organização Pan-Americana da Saúde, 1995. p.177-84. FERREIRA, J.B.B. Avaliação do complexo regulador do sistema público municipal de serviços de saúde. 2007. Tese (Doutorado) - Escola de Enfermagem de Ribeirão Preto, Universidade de São Paulo, Ribeirão Preto. 2007. LOPES, S.L.B; SANTOS, J.S. ; SCARPELINI, S. The implementation of the medical regulation office and mobile emergency attendance system and its impact on the gravity profile of non-traumatic afflictions treated in a University Hospital: a research study. BMC Health Serv. Res., v.7, n.1, p.173, 2007. MENDES, E.V. Os sistemas de serviços de saúde: o que os gestores deveriam saber sobre essas organizações complexas. Fortaleza: Escola de Saúde Pública do Ceará, 2002. MINAYO, M.C.S. O desafio do conhecimento: metodologia de pesquisa social (qualitativa) em saúde. São Paulo: Hucitec,1998. MISHIMA, S.M. A gerência de serviços de atenção primária à saúde como instrumento para a reorganização da assistência à saúde - o caso do Programa de Saúde da Família. 2003. Tese (Livre-docência) - Escola de Enfermagem de Ribeirão Preto, Universidade de São Paulo, Ribeirão Preto. 2003. MONKEN, M.; BARCELLOS, C. Vigilância em saúde e território utilizado: possibilidades teóricas e metodológicas. Cad. Saude Publ., v.21, n.3, p.898-906, 2005. MORAES, I.H.S. Informação em saúde: da prática fragmentada ao exercício da cidadania.São Paulo: Hucitec, 1994. MORAES, I.H.S. ; GÓMEZ, N.G. Informação e informática em saúde: caleidoscópio contemporâneo da saúde. Cienc. Saude Colet., v.12, n.3, p.553-64, 2007. MORAES, I.H.S. ; SANTOS, S.R.F.R. Informações para a gestão do SUS: necessidades e perspectivas. Inf. Epidemiol. SUS, v.10, n.1, p.49-56, 2001. ORGANIZAÇÃO PAN-AMERICANA DA SAÚDE. OPAS. Renovação da atenção primária em saúde nas Américas. Washington: OPAS, 2007. ROVERE, M. Redes en salud: un nuevo paradigma para el abordaje de las organizaciones y la comunidad. Rosario: Editora Secretaria de Salud Publica/AMR, 1999. SANTOS, J.S. et al. Clinical and regulatory protocol for treatment of jaundice in adults and elderly: a support for health care network and regulatory system. Acta Cir. Bras., v.23, supl.1, p.133-42, 2008. SANTOS, J.S. et al. Avaliação do modelo de organização da unidade de emergência do HCFMRP-USP, adotando, como referência, as Políticas Nacionais de Atenção às Urgências e de Humanização. Medicina (Ribeirão Preto), v.36, n.2/4, p.498-515, 2003. SAÚDE, M.I.B.M. Interrogando a operação da rede de serviços de saúde. 2006. Tese (Doutorado) - Escola de Enfermagem de Ribeirão Preto, Universidade de São Paulo, Ribeirão Preto. 2006. SILVA, A.X. ; CRUZ, E.A. ; MELO, V. A importância estratégica da informação em saúde para o exercício do controle social. Cienc. Saude Colet., v.12, n.3, p.683-8, 2007. STARFIELD, B. Atenção primária: equilíbrio entre necessidades de saúde, serviços e tecnologia. Brasília: Unesco, 2002. THIEDE, M.; MCINTYRE, D. Information, communication and equitable access to health care: a conceptual note. Cad. Saude Publica, v.24, n.5, p.1168 -73, 2008. TRIVIÑOS, A.N.S. Introdução à pesquisa em ciências sociais. São Paulo: Atlas, 1995.
i Address: Rua Cerqueira César, 845, apto. 101. Centro, Ribeirão Preto, SP, Brasil. 14.010-130.